Laura Altobelli is a full-time senior editor for GSW Worldwide, an advertising agency serving the pharmaceutical industry. With a master's degree in scientific communication and more than 20 years of professional experience, Altobelli has worked with physicians, lawyers, veterinarians and architects to develop content for professional symposia and such publications as "Annals of Internal Medicine," "Journal of Trauma" and "Clinical Infectious Diseases." Whether you are cooking Arborio, basmati or risotto, your Rival rice cooker can consistently deliver a fluffy serving of grains if you follow the manufacturer’s instructions. Although features and capacity vary by model, most Rival rice cookers are constructed similarly and operate under the same general principles. Measure the amount of rice you wish to cook. Most smaller-capacity Rival models (less than 10 cups) are sold with a 2/3 cup measuring cup that should be filled once to yield 2 cups of cooked rice. Rinse the measured rice in a small or medium mixing bowl of cold water. Drain the rice in a cooking strainer. Place the rinsed rice into the cooker’s inner pot. Wipe away any water that might have dripped down the outside of the inner pot. Place the inner pot inside the rice cooker. For most Rival cookers, you might need to rotate the inner pot slightly from side to side until you feel it make full contact with the heating element. Place the lid on the rice cooker. Plug the rice cooker into a 120-volt AC electrical socket. Turn on the rice cooker by pressing the “Cook” button. Look at the “Cook” indicator light to be sure it is lit. When the water has evaporated, this light will turn off and the “Keep Warm” indicator will light. For fluffier rice, let the rice stand for 15 to 20 minutes before removing the lid. Remove the lid and serve the rice with the ladle provided with your Rival rice cooker. The ladle will protect the nonstick surface of the inner pot. When using rice that has been in your pantry for a long time, soak the grains for 30 minutes before cooking to prevent breakage. Basmati rice is commonly soaked to help the grains to their full length. Drain soaked rice thoroughly before cooking to prevent mushiness. If the rice is still too firm for your liking after the cooking cycle ends, add a tablespoon or two of water and set the cooker to "Cook." A few additional minutes will soften the grains a bit more. 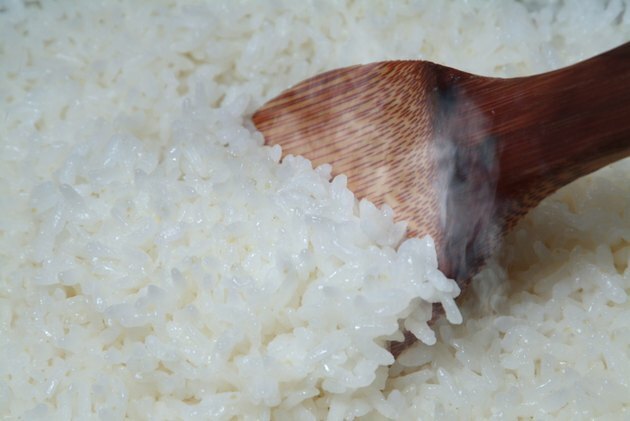 Brown rices and Arborio (risotto) require more water than white rice, and sushi rice tends to require less. Do not use instant rice in Rival rice cookers. Do not immerse the heating unit portion of your rice cooker in water. Use care when lifting the lid of your rice cooker to avoid being scalded by steam.